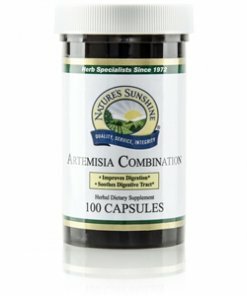 Nature’s Sunshine Artemisia Combination is a reformulation of Nature’s Sunshine’s former Elecampane Combination with the addition of two species of artemisia, wormwood (Artemisia annua) and mugwort (Artemisia vulgaris) which help support intestinal flora. Both species of artemisia are traditionally used for the benefits they provide to the intestinal system. The Artemisia Combination also contains elecampane root, clove flower buds, garlic bulb root, ginger root, spearmint herb, and turmeric root to create a rich source of nutrients for the digestive system. Instructions: Take two capsules with a meal three times daily for 10 days, then discontinue use for 5 days. Repeat this cycle (10 days on, 5 days off) for up to 60 days. For best results, use with Chinese Para-Cleanse.